MONTY ELMO KIMBALL, age 82 of Sidney, IA died Friday, January 25, 2019 at Grape Community Hospital in Hamburg, IA unexpectedly. Monty was born September 5, 1936 in Harlan, IA to Elmo Wheeler Kimball and Genevieve Elda (Dinsmore) Kimball. Monty served in the US Navy as an E-8 Chief Electrician for several years and was especially proud of his time spent in Japan. On January 28, 1957 he was married to Midori Ohta in Okazaki, Japan. 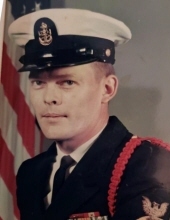 Following his time in the Navy, Monty worked as an Electrician in Southeast Nebraska and Southwest Iowa for many years and for a time owned and operated the Sand Bar in Sidney. Monty was preceded in death by his parents and 2 sisters, Glenda Proctor and Jenelle Nenneman. He is survived by his wife, Midori Kimball of Sidney, IA; daughter, Arlene Smith and husband Stephen of Hamburg, IA; 2 grandchildren, Alex Smith and Sonia Smith; 1 great grandson, Jesse Smith; 3 sisters, Mickie Gessart, Ellen Wagoner and Debbie Strong; numerous nieces, nephews, many other relatives and friends. There will be private family memorial services and disposition of ashes at a later time. There will be no viewing or visitations and a memorial fund has been established. The Crawford-Marshall Funeral Chapel in Sidney, IA is in charge of arrangements. To plant a tree in memory of Monty Kimball, please visit our Tribute Store. "Email Address" would like to share the life celebration of Monty Kimball. Click on the "link" to go to share a favorite memory or leave a condolence message for the family.